Everything about nail care. How to do it, when to do it, what to use, and mostly everything else you need to know about nail care. Need a gift for someone special? Check Mont Bleu for a variety of options. Looking for a gift for someone special? Have a birthday, wedding, baby shower, or any other event coming up? At Mont Bleu we have specialized in the manufacturing of durable glass nail files as well as many other Bijoux and beauty products. All of our products are decorated with Swarovski elements. On our e-shop, you can find three-piece gift packages containing a glass nail file, tweezer, and a compact mirror. In addition to our packages, we produce personalized items such as nail files, name card cases, key rings, bag hangers, and pill boxes. Still, can’t find what you want? Browse our vast selection of other nail files and beauty tools as we have something for everyone. Mont Bleu delivers its products all over the world, which is why clients from the USA, Canada, the EU, and Asia are buying our products with great pleasure. 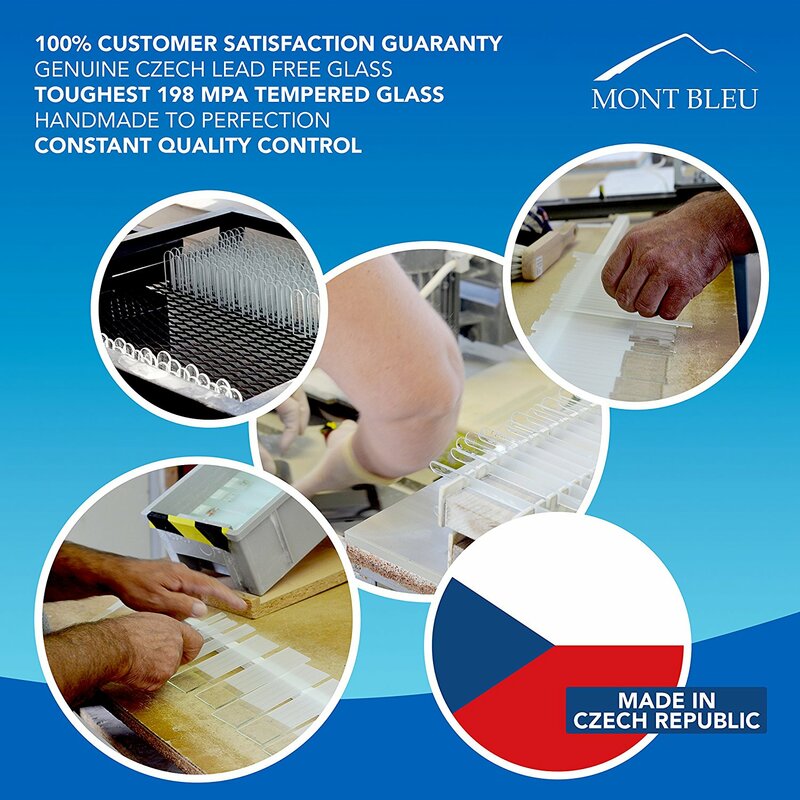 Our company offers only the highest quality of production approved and certified by the Czech Republic and the EU. 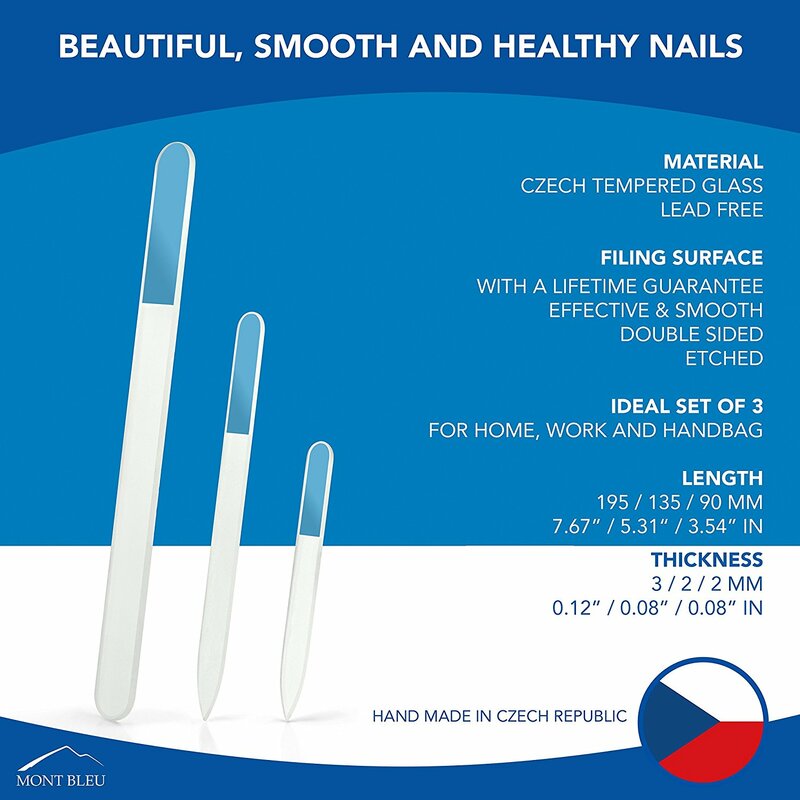 Our glass nail files were tested and approved by the Czech Institute of health. 1. So what’s a glass nail file? It’s a nail file or ’emery board’ made of glass. You use it to shape, shorten and take care of your nails in general. Simple as that. If you use an emery board or metal, sapphire, ceramic or diamond nail file, then you know what a glass nail file is and what it’s used for. Easy-to-hold handle – which you use to hold the nail file while using it. Body – an abrasive surface, which is used to file, shorten and shape the nails. End/Tip – it’s pointed to clean under nails, or rounded to take with you on a plane and/or for baby nails. 2. How do I use a glass nail file? You don’t have to worry about applying pressure to the file when filing if it’s a high-quality glass nail file then it was hardened and won’t break when in use under normal circumstances. Mont Bleu glass nail files are the double tempered and are the toughest with 198 MPa glass toughness. 3. Are there different sizes and types of glass nail files? There are, and they differ in length, thickness, ends, and surface. Small for the purse, medium-all-purpose and large for professionals. The foot one is for a pedicure. Small and medium files come in 2 or 3 mm (0.08” or 0.12” inches) thickness. Large files come in 3 or 4 mm (0.12” or 0.16” inches) thickness. Foot files come in 6 or 8 mm (0.24” or 0.32: inches) thickness. Scraper nail file has 2 different sides, one classic smooth, and the other a rougher side. 4. How do I take care of my glass nail file? How to clean/wash it? The first rule would be: avoid dropping them, even with high-quality files there is a chance of breakage. For the inexpensive ones, they can break in a heartbeat. Second rule: while in the purse or bag try carrying them in a sleeve or protective case. It will help prevent accidental breakage. Third rule: after several uses or after each, clean them under water, as water will remove the nail dust that’s left on it after filing. Brush the surface with some sort of brush to make it like new. The glass does not absorb anything, so if you are the only one using it, there is no need to sterilize it using some special techniques like UV light, alcohol or antiseptic spray. But it’s recommended to do it once in awhile. 5. Is it safe to use it for baby’s nails? It is, but only adults must file their nails and do not leave them unattended with a baby. Use files with rounded tips. More on filing baby nails here. 6. Are they ok for dog and cat grooming? They are, we suggest using large Scraper files for this purpose. 7. Can I take one with me on a plane? Yes, you can, in fact, most people carry them when traveling. But as we were told by Airline officials, the security control can take away any object if they consider it a threat. 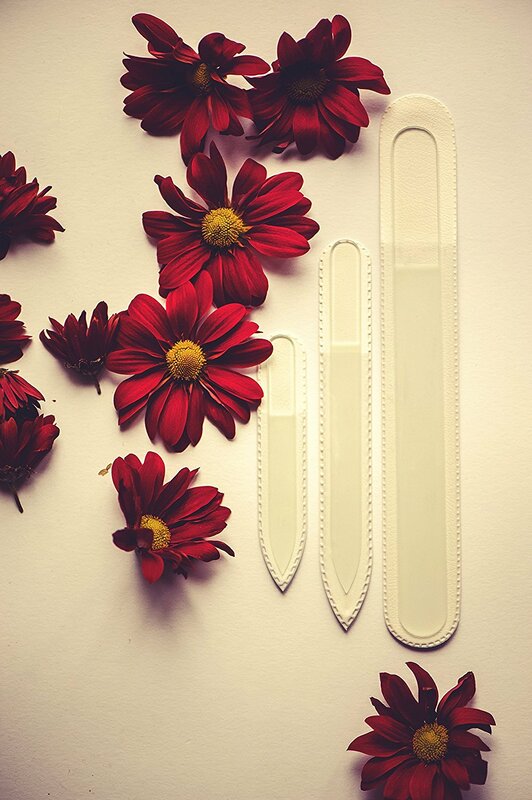 Try rounded glass nail files to make sure no one takes your precious nail file from you. 8. Are they good for natural and gel/acrylic nails? In general, glass nail files are better for natural nails. Sure they will work with gel and acrylic too, but will take a longer time to file. And the main reason for using glass nail files is that while filing it doesn’t destroy the nail, which makes sense if they are natural. 9. Is there a difference between crystal nail files and glass nail files or crystal glass nail file? Which are better? What they are really made of? Basically different names for the same thing, and there are no guarantees of quality. Here is the thing: there is Crystal, then there is Float Glass, and also there is Crystal Glass, also called Lead Glass. As you can see crystal, crystal glass and glass are different kinds of materials. The original glass nail files are made of Float Glass, not crystal or crystal glass. So why all the different names? Well, its marketing to differentiate products. 10. So since they are made of glass do they break while using? Mont Bleu Czech made glass nail files do not break while you are using them. The glass is tempered twice: first when the glass is made and secondly when the nail files are made. A 198 MPa glass toughness is achieved, the best among any glass nail files. Glass nail files can break, as any other glass product, even bullet resisting glass can break. Just try not to throw it with force on a hard surface, and it should be fine. The Mont Bleu nail file will serve you for many years. 11. Do glass nail files really last a lifetime? Do they go smooth or dull? The Mont Bleu Czech glass nail file – filing surface, will last forever. Long story short: the surface that files your nail is made in such a way that it’s technically the file itself and it can’t go dull. There are other types of glass nail files, most of the time they are very cheap, but the price is not always the factor of high quality. There is a very nice opinion on that from Ellie on personellietea.com, Ellie tried several different brands, I suggest you checking it out. On such files the surface is sometimes very rough and gives you goose bumps, sometimes it’s too smooth and not filing the nail, sometimes they just go dull after several uses, and sometimes they are a combination of several. If your glass nail file went dull, throw it out and get yourself a proper glass nail file. Don’t be disappointed by the first glass nail file you had, just do some research on your next one. A simple “glass nail file review” on google should be enough. 12. I saw a cheap 1$ or 1€ or 1£ nail file? Is it the same glass nail file? I think you know the answer. No, it’s not the same as Czech glass nail files by Mont Bleu. Non-tempering, sometimes lead is used that can make them break while you use them, potentially cutting yourself and exposing broken glass to more cuts. The file needs to be made from hardened glass and go through additional tempering process, to make sure it will not break easily. We’ve compared Mont Bleu file and a Chinese one in this video. Surface going dull, the process of manufacturing an original glass nail file is changed in such a way and as a result you can get sprayed or glued glass crumbs that will go dull after several uses. Sometimes the base of the file is not even glass, it can be plastic with glass dust on it. Not effective surfaces, are used, so when it’s so smooth it does not file the nails, so you file so fast and with so much force, you might as well use any surface to shorten your nails. The surface is sprayed or glued glass dust, or cheap acid. All of these and other methods can make a very rough surface that will give you goosebumps and writing on a chalkboard like feeling. Not only it, not a pleasant way of filing your nails, such surfaces will go as far as damaging the nails, eliminating all the advantages of using original glass nail files. The glass nail file needs to be a high-quality one, not a cheap knock-off for it to be effective, easy to use, and help make your nails healthier, only a durable, real – Mont Bleu Czech glass nail file delivers that. 13. What’s the difference between glass nail file and other files (like an emery board, metal, ceramic, diamond, sapphire, and others)? The biggest difference is not how they look, but how they file your nails. The glass nail file abrasive (working or filing if you wish) surface structure allows it to file the nails without snagging, cracking, breaking, chipping, splitting and peeling. It makes the nails stronger, and because of that healthier. One more thing, the glass nail file filing surface will last a lifetime. That’s right, no matter how many times you use it, it will file the nails like it was bought yesterday. 14. So are they better than emery boards or whatever nail files? Glass nail files are definitely better than other types of nail files. They prevent nails from splitting and peeling, leaving them much smoother after the filing. With continued use, nails tend to become stronger and healthier. Lisa from Polished Elegance: “They are without a doubt the best glass nail files I have ever tried, or just the best nail files I’ve tried period. I used them to file down my nubbins, and it was so quick and easy! Only thing is to be careful when you’re filing so you won’t do too much, they are so effective”. Here are a few more glass nail files reviews & glass nail files video reviews. 15. Where do I buy a glass nail file? You can also try and find one in a store near you, just type the name of the city and “buy glass nail file”. I do strongly recommend reading reviews about the brand you want to buy, just to avoid bad experiences. Ever Wondered What the Half Moon Shape On Your Nails Means? The Answer Is More Important Than You Think! Our fingernails and toenails are more than just a canvass that we can adorn with pretty nail polish and do our regular cleaning duties. Nails, as small as their part in our bodies, have bigger reasons why they are put there. Although we often take our nails for granted – in the overall health sense – they actually mean more to our health than we know. Our nails reveal a lot about our entire health. In Chinese remedies and even in conventional medicine, the status, color and health of our nails are said to reflect our health and possible underlying diseases that have yet to be discovered. Now, that got your attention, huh? If you take a closer look at your nails, you will discover that it has two or three contrasting colors – white, brown (which reflects the color of the skin), and red (which reflects the color of the insides of the nail). In entirety, the nail is actually white in color, or more transparent. Nails are essential parts of your fingers and toes where there are a lot of nerve endings that it protects. Thus, healthy nails are important, which means it should be strong, it should have a healthy color and the cuticle should be intact to protect the surroundings of the nails. You’re probably looking at your nails right now and wondering: what is that half-moon whitish shape at the base of your nails? Everyone seems to have that too. Is that some sort of genetic resemblance among people? The answer will surprise you. First of all, the small whitish area on your nails is called lunula, a Latin word for small moon. The lunula is the most sensitive part of the nail because it is the nail’s root. A damaged lunula would lead to a totally damaged and deformed nail. Whereas, if the damaged area is around the lunula, it will grow back normally since the root is untouched. As important as it is to our nails, the lunula also holds important information to our overall health. The color of lunula, if it is anything other than white, can reveal certain underlying diseases in our body even before other symptoms can show. Lack of color of the lunula can signify anemia or malnutrition. Reddish smudges inside or around the lunula may mean cardiovascular problems. Bluish or pale color may mean possible diabetes. Lack of lunula may mean slow metabolism or indigestion. Soak your fingers into olive oil for about 15 minutes and rinse with water. The minerals from olive oil will keep your nails strong and sturdy. Mix avocado, honey, salt and egg yolk into a paste. Rub the paste into your nails and let it sit for about 30 minutes then rinse with water. Do this twice or three times every week for a strong, healthy and shiny nails. Maintain a healthy diet. Your nails will reflect your inner health. Thus, healthy nails mean healthy body. Add supplements to your diet such as calcium, zinc, iodine and vitamin A. These supplements are good for the body and great for the health of your nails. Now you know more about nails and how important it is to our body. By all means, you can still indulge on nail art and all those nail designs, as long as you ensure that it does not affect the nail health. Remember, a lot can be said about your health by just looking into the surface of your nails. So keep your nails fungus free and happy. Use foot files and other nail tools to maintain healthy looking nails. Gel nails are one of the hippest nail trends right now, but with this, chic chicks now face a new problem: Gel nails are extra difficult to remove, probably as well as acrylic ones. Sure, you have your go-to nail salon, but sometimes it is either you cannot find time or you just do not want to spend moolah to have them removed. Luckily, there are easy ways of removing your Gel nails at home. Place the dental floss under a part where there is visible lift. Slowly tug the floss back and forth until it moves across the entirety of the nail. It is advisable to wait until the nails are mostly chipped away to reduce damage to nail surface. Alternatively, a cuticle stick is usable. However, you do run the risk of overdigging. Start by filling half a large bowl with warm water followed by placing a small bowl filled with acetone inside. Let it sit for 3-5 minutes. Afterwards, remove the smaller bowl from the warm water to prevent overheating. Do not forget that acetone is extremely flammable, so stay away from any direct heat. Prep the skin around your fingernails by coating it with petroleum jelly. Use cotton swab to coat petroleum jelly around your nails edges. Do not apply on the nails themselves. Dip fingers in the bowl of acetone and soak for 30 minutes. Use cotton balls to rub the gel off of your nails. Once satisfied with the removal, file your nails to your desired shape and buff nail surface to remove rough edges. For people with sensitive skin, this next method requires less acetone exposure. In this method, you do the same prep and finishing, but instead of having fingers soak in a bowl of acetone, you dip cotton balls in acetone and put them on your nails. Proceed to covering each nail with aluminum squares and soak for 30 minutes. Remove the loosened gels with cuticle sticks. Finish off with nail filing and buffing. Do not forget to moisturize! In the absence of aluminum foil, use masking tape as an alternative. Nail Mates are caps with foam pads used to saturate with acetone and placed atop the fingernails. They are much like method 3, but they are better at preventing the acetone from evaporating and best of all, they are reusable. After Nail Mates have soaked nails completely, proceed to rub the softened gel off with a cuticle stick followed by filing, buffing, and moisturizing. Stuff the sponge around the jars interior. Do this in such a way that it spirals from the top view. Completely soak it in acetone and use it to dip and rub your nails. This also works great on glitter polishes. This method, like method 1, does not involve the use of acetone. However, you might remove your nail surface if you do not pay attention and end up over-filing. Start by evenly filing down the gels surface using a coarse-grit side. Avoid trying to do this quickly. Frequently wipe dust away to avoid filing actual nail surface by mistake. Once you have filed most of it off, you may now use the fine-grit side. Buff and moisturize to top it all off! Get your PRO glass nail file here. Nails are among some of the most treasured accessories by women. Nails complement your make up, which speaks volumes about your personality. Apart from the face and the hair, nails deserve sufficient attention. To get the best, you need to know which nails are best for you. Of course various types of nail shapes exist: from Round, oval, squoval, square, almond and stiletto, among others. If you really value your nails, and I know you do, take budget for time to do them at least weekly. If it is difficult for you to get to the salon every other week, spare some minutes out of your busy schedule to do them yourself. Don’t forget that shaping them is a magnificent substitute for manicure. Determining the best shape for your nails is usually a tricky bit for some people. However, this shouldn’t be a headache. All you need to do is look at the shape of the cuticles. Some are curved, while others are squared. Some may be squared but have rounded edges. These shapes indicate which nail shapes work best for you. If you are a lover of almond nails, then read on to find out how you can shape them to your utmost satisfaction. How best should you shape your nails? This depends on you as an individual. First decide how you want to do it. Do you want to use a file, or a clipper? While some argue that using files is the best way to shape nails, there are those who contest that using nail clippers is their way. Some experts offer that both are applicable depending on the nature of the nails and the shape you want. They argue that if the nails are long yet you want them short, you may begin by snipping those using clippers before shaping them using a file. Quite some insight, huh! However, in this case, you need to be very careful, lest you over-trim the nails to make them shorter than you really want them. Just trim them a bit longer that you want before engaging your file. If you desire lady-like nails, then go for almond. To get this shape, follow this five simple tips. 1. Determine the central point of your nail and mark it. 2. The next step is to begin filing your nail towards the central spot. 3. Let your filing be angular in nature, allowing the angle to be just off the central spot. This leaves a flat tip to be rounded out. 4. Having fixed the angles on the sides, now file the angular corners, smoothing them out as you proceed to the last step. 5. Blend the smoothed out angles into an almond shape. This is the final and most vital step in shaping short almond nails. Almond nails elongate your fingers while at the same time adding a feminine touch to your fingers. Remember that the shape of your nails is your discretion and you can always change the shapes into something more trendy and fashionable to suit your desire. However, to change your nail shape, you always have to be patient until they elongate. You may also seek advice from experts if you are not sure about what is best for you. Use glass nail files to shape your nails. Get them here or here. Cuticle scissors from Mount Bleu are scissors with curved but flat blades used for trimming cuticles. The scissors have sharp but gentle blades and needle-sharp tips that aid in accurately trimming cuticles. Additionally, the scissors that are supplied by a German producer are decorated with beautiful crystals to make the using experience exciting. Scissors are reported to be in invented around 1500BC in the ancient Egypt. Around 1761, Robert Hinchliffe made pivoted scissors using polished steel. But it was in 19th century that different types of scissors including cuticle and nail scissors were made to aid in carrying out some activities. For instance, cuticle scissors came into place due to the need to remove cuticles without hurting oneself. These scissors were hand-forged and had their handles decorated using beautiful items. Mount Bleu cuticle scissors are a must-have manicure tool for every lady and salon. Their handles are designed in such a way that they offer comfort and stability when trimming the cuticles. The scissors can also come in handy when you simply want to remove a loose thread or remove tags from clothes. Moreover, they are made of high-quality material that makes them durable and able to retain their functionality. The cuticle scissors are mainly of silver, but the Swarovski crystal decorations are different in colors. Some of them are colored pink while others silver among other colors. Some of their handles are plain while others are made of rubber for comfort ability while handling them. Cuticle scissors from Mount Bleu are made using stainless steel that is of high quality and decorated with stunning Swarovski crystals. The materials used are long lasting and of exceptional quality. Getting a gift for your best lady friend can be quite tough; bearing in mind that women love different things. Well do not get worked up, women love to keep their nails and cuticles neat, so why not get her a cuticle scissor? Along with it, you can get a whole set of manicure tools to complement the gift. We bet, she will surely love it! Cuticle scissors are not only useful to women, but also to men. All of us have cuticles; what makes the difference is how we take care of them. Our cuticle scissors can help you take care of yours and make your nails look neat. Men, do not shy away from getting cuticle scissors, you sure do need them. Our cuticle scissors are available for both retailers and wholesalers. The prices set for the products are reasonable enough to help you as retailers get a good profit out of them. You can contact us to get the terms and times of delivery, as well as the prices. You can use our cuticle scissors to promote your products, companies of events. All we do is apply your logo or company name on the blades of the scissors. There are different methods we use to apply the logos. Sandblasting is one of them and it the most durable method as the writings can last as long as the lifespan of the tool. This method leaves an attractive and neat impression on the scissors better than any other methods. Swarovski crystals on scissors make them good for souvenirs. They are unique and quite sparkly, and we can make them according to the design you want using 3D label technology. They will stay long on the scissors without coming off making them good for resale especially to tourists who love souvenirs. Where to get cuticle scissors? Our nails typically define us in certain ways based on they are groomed. Even if most people like long nails, we ought to understand that the beauty of nails is not in their lengths but how well they are maintained so that they do not break easily. It is for this reason that manicure came up as it enables both women and men to take care of the nails whether professionally or on their own. Well, we have some of the best manicure sets that will help you achieve your dream of well-manicured and maintained nails. Solingen leather manicure set is purple in color and has nail scissors, Mont Bleu glass nail file, and tweezers. The leather case is a genuine one, and it has a push button for easy opening. The tweezers are made of stainless steel, have slanted tips and rubber handles to make it comfortable to use. Both the tweezers and glass nail file are decorated with Swarovski crystals to enhance their appearance. The manicure set is fit for you since it holds the basic manicure tools and is perfect for travel and everyday use as it can be carried in a purse. Get it here. The leather manicure set is black in color, and it holds tweezers, nail scissors, and Mont Bleu glass nail file. The glass nail file is made in Czech Republic while the nail scissors in Solingen Germany. The tweezers are slightly slanted at the tips and have rubber handles to make it easy and simple to use. Our male customers love it since it is plain; most men do not like sparkly crystals and so this manicure set fits any man perfectly.Get it here. This manicure set is black and is decorated with Swarovski crystals. It has tweezers, nail scissors and glass nail file. The leather case is genuine and, therefore, durable. Moreover, it has a push button for easy opening. Mont Bleu makes the glass nail file while the nail scissors are made of stainless steel in Germany. The glass nail file and tweezers are hand decorated with Swarovski crystals and, therefore, attractive to many women. Many women love this manicure set due to the durability it offers along with the high-quality manicure tools it contains.Get it here. The pink manicure set is made of a genuine leather ad has scissors, tweezers, and Mont Bleu glass nail file. The scissors are made of quality stainless steel in Germany for durability while the glass nail file in made using tempered glass from Czech Republic. The tweezers are also made of stainless steel with slant tip and rubber handles for easy usage. Our customers love it since t is perfect for everyday usage and travel.Get it here. The red manicure set contains a cuticle pusher, Mont Bleu glass nail files, and Solingen nail scissors. The red leather case is genuine and made with a push button for easy opening. All the manicure tools are made of quality material that ensures that you get quality manicure service. The glass nail file has decorations f Swarovski crystals, and it makes it perfect for young ladies who love sparkly things and elegance.Get it here. The turquoise manicure set made with crystals has Solingen nail scissors, tweezers, and Mont Bleu glass nail file. The manicure set is small enough to fit in your purse, and so you can carry it around when traveling or just going for a short walk or drive.Get it here. The set has mini glass nail file and blue nail scissors. The nail file is made with Swarovski elements, and the leather case is genuine. The set can fit into any woman’s purse and, therefore, perfect for travel. The set can fit into a purse.Get it here. Where to get the above mentioned manicure sets? Beauty is one of the few fields of art in which women have excelled more than men by far. This is no surprise, given that women are very sensitive to beauty and looks than men. Compared to women, only a small number of men are into fashion. Talking of beauty, it involves quite array of factors, one of which is nails. They are very integrated in the final makeup. That is why much attention is given to them, just as it is with the face and the hair. They complement all other makeup accessories. This is where manicure and pedicure come in: The art of working up the nails to awaken their innate beauty. Manicure involves many things which include but are not limited to nail painting, nail trimming and nail filing. As they say, necessity is the mother of invention. The desire for well shaped nails has over the years triggered creativity and invention, the nail clipper and the nail file being no exception. In many cases, both manicure tools are used together, the clipper first, then the nail file next. The nail file is used to finish off the job of smoothing and shaping the nails. Quite a variety of nail files exists. This includes emery boards, glass, ceramic and metal files. Some metal files are coated with corundum, while others are just plain. Some nail files are more abrasive than others, the most abrasive and durable as well being the glass file. The emery file is considered to be the least abrasive. You take longer to achieve the desired effect when using it. However, it is important to mention that shared nail files have the potential to spread diseases. Therefore, before such files are used on a different person, proper sterilization has to be carried out. But what do you know about the origin and history of nail files? Here are some interesting facts you want to learn. 1. The nail file was in use as early as in the days of Marie Antoinette, queen of France, who lived between 1755 and 1793. The pencil-like nail file she used was made from pumice stone. Many ladies in the court of Versailles admired her perfectly shaped nails, hence embracing the use of the pumice stone nail file. 2. Marie Antoinette’s pencil-like nail file was never thrown away. Instead, it was sterilized (hand-washed) and stored by her maids for future use. 3. Before the invention of the nail file, women used different things to shorten and shape their nails. These included various metals, scissors and even acids! You can imagine how dangerous it was! 4. The nail file was actually invented by doctor Sitts, a foot doctor, in the 1830s. His was a creation of an ‘orange stick’ from a yet to be known tool used in the treatment of dental problems. Women used it to file their nails down. 5. Continued evolution of the nail file has led to the invention of the glass file, the latest, most durable and most effective nail file. There you are now, with crucial facts about the nail file. Just as the nail file has evolved over the years, so has been the nail technique of manicure and pedicure. This is not about to stop. As long as the end of the world tarries, you can be sure that these techniques and tools shall keep evolving, generation after generation. Get the best in the nail file industry, the glass nail file here. Nail scissors offered by Mont Bleu are small but solid with mostly curved blades. They are made of stainless steel and decorated using Swarovski crystals that are of high quality. The scissors are majorly supplied by a German producer who offers quality products. Their primary use is in shortening and shape finger and toenails. Moreover, they can be used to cut corners and cuticles. Scissors were invented in ancient Egypt around 1500BC. Pivoted scissors came into place around 1761 when Robert Hinchliffe produced scissors made of polished steel. But it was not until the 19th century that other types of scissors like nail scissors were produced. The scissors were hand-forged, and their handles decorated. Our nail scissors are designed elegantly and are an excellent additional tool for every woman’s manicure set. They play multiples roles; apart from nail cutting you can use them to remove tags from clothes or snip loose threads. They are good for trimming nails neatly and smoothly without splitting, breaking or squeezing the nails. Their handles are shaped ergonomically shaped to offer stability and comfort while trimming nails. Moreover, the high-quality craftsmanship makes them durable and able to retain their functionality long enough. The nail scissors are mainly of silver, but their crystal decorations vary in color including purple. Some of their handles are made using rubber to make the handling process easy and much comfortable. With so many nail scissors available, which are the best ones? We tested them, find out the results on Top 7 Solingen scissors here. The nail scissors are made using high-quality stainless steel and decorated with beautiful Swarovski crystals. The materials used are durable and of excellent quality. Deciding on the type of gift to get a friend or a family member on a special occasion can be very hard. Even so, you can consider getting them nail scissors decorated with beautiful scissors. Along with it, you can buy for them a whole set of manicure tools to help them keep their nails neat all the time. Manicure is known for women only, but men are also seeking these services. Different salons offer these services, but you can also do the manicure yourself. Nails reflect a lot about a person hence there is the need to keep them neat and trimmed using nail scissors. Our nail scissors are both available for both retailers and wholesalers. The prices we have set for our products are affordable for all, and they can earn sellers a good profit. You can get in touch with us for us to provide you the prices, the time and terms of delivery. We can help promote events or companies using our nail scissors. We apply a catchphrase, logo or name of the company on the blades of the scissors. We use different ways of putting the logos including sandblasting, hand painting, or printing. Sandblasting is one durable method that can last as long as the scissors’ lifespan. Moreover, they make a better impression on the scissors than the other methods. We can also use Swarovski crystals to hand-make your logos and make them look luxurious and beautiful. The beautiful crystals on the scissors are attractive and make them good for mementos. We employ 3D label technology to create the design you want on the nail scissors. They are durable yet affordable and hence will find a place in the market despite a stiff competition. Other methods we use are sandblasting and offset printing. Swarovski crystals are also used to make the scissors unique and elegant. Where to get Solingen nail scissors? 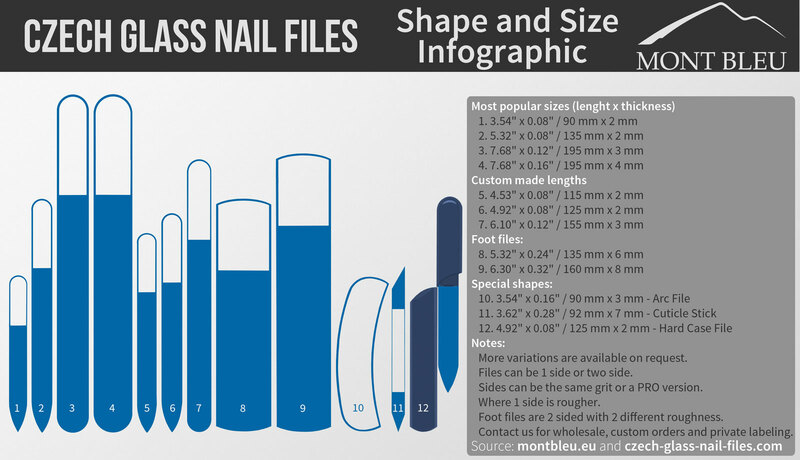 In this site, the files are described as the best glass nail files ever tried. They are said to be quick and easy in filing the nails though caution has to be taken as they file quite some length in a short while. Full review here. The files are termed as beautiful and less abrasive than the standard files. It also states that they file the nails with slight pressure and leaves the nails completely smooth. Full review here. Makeup withdrawal describes the files to be of good quality and true, unlike the many fake glass files. It also states that they are quite sturdy, of good proportions and have finely etched sides that result into smooth finish on nail edges. Full review here. The site terms the files as the best glass nail files in the market. It states that the files are eye-catching due to the Swarovski crystals, and they work effectively due to the different grits they have on either side. Full review here. Wacky Laki describes the files as fine though they are not sure of the exact grit. The larger file is described to be easy to use to file longer lengths of nails while the smaller file is appropriate for final touches or for carrying around in purses. Full review here. The site states that the files are well made, do not look cheap and they come in a suede protective case. It also states that the surfaces of the files are rough enough to file nails in a short while leaving the nails not splintered. Full review here. Adventures in acetone describe the nail files as being quick in filing without causing a tugging feeling. The small crystal nail files are described as being suitable for carrying around in purses. It also states that the hard case file, which do not have decorations, are suitable for males. Full review here. Among the three files reviewed, all are termed as having a fine grit and takes a short time in filing the nails. 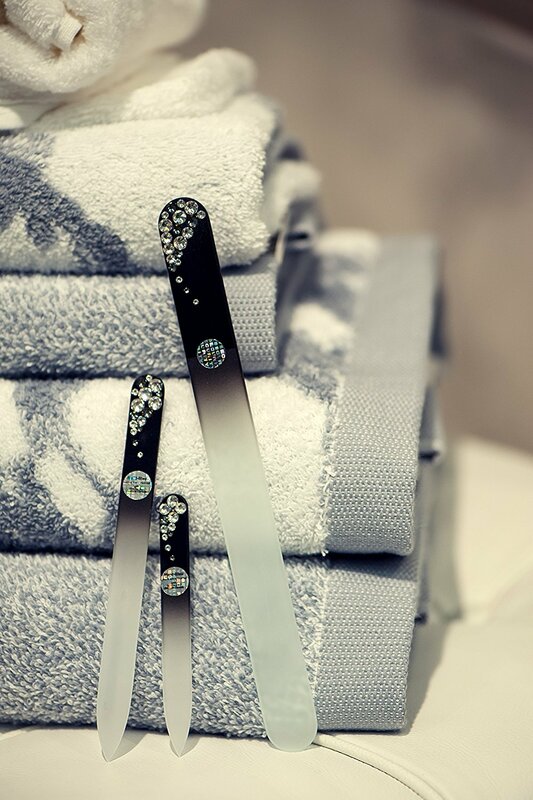 The standard and travel sizes nail files with Swarovski crystals are also termed to be of good quality. Full review here. The site describes Mount Bleu nail files as having sharp ends with good grits. It also describes them as smooth with crystals that are well fastened with no glue oozing out from them. The finish is also described as professional, but care has to be taken when using them since it files more length than regular files. Full review here. The surfaces of the files nails are described as gentle and so cannot ruin the nails. Even so, it describes it as perfect for the sealing and shaping part. Full review here. The site describes the largest nail files as suitable for toenails whereas the standard size is described as good for taking down the length and for getting smooth edges. The mini file can easily fit in a purse, but all are durable. Full review here. According to the site, all of the files reviewed are easy to use since they can take down length and buff edges with ease. Full review here. All the files reviewed are stated as being of excellent quality. The glass is described as thick and works well in shaping and smoothing nails. The Swarovski crystals are also noted as a good design. Full review here. The site describes the files to be of high quality with their main use being finishing and touching up the nail shape. However, breakage of the files is not guaranteed especially if not handled well. Full review here. Where to get Czech made Crystal nail files and Glass nail files (which are the same thing)? What do your nails say about your destiny?